Opinion: Moon Jae-In Can Put U.S.-North Korea Negotiations Back On Track. Here's How South Korean President Moon Jae-in must insist on denuclearization in coordination with the United States, even at the risk of renewed tensions between North and South Korea. 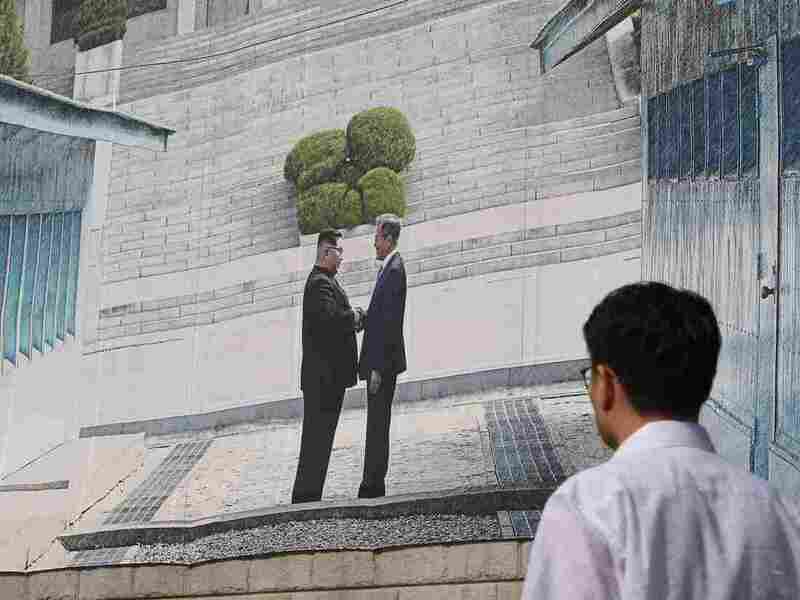 A man walks past a giant banner showing a picture of the summit handshake between South Korean President Moon Jae-in and North Korean leader Kim Jong Un, at Seoul City Hall on Sept, 13. Moon will fly to North Korea's capital on Sept. 18 for a third summit with Kim. Scott Snyder (@snydersas) is senior fellow for Korea studies at the Council on Foreign Relations and author of South Korea at the Crossroads: Autonomy and Alliance in an Era of Rival Powers. South Korean President Moon Jae-in has doubled down on efforts to prevent U.S.-North Korean negotiations from careening off course. After Secretary of State Mike Pompeo's August visit to Pyongyang was canceled, Moon sent a team of special envoys to the North Korean capital to jump-start the diplomatic process between North Korea and the United States by securing Kim Jong Un's public reaffirmation of his commitment to denuclearization. Starting Tuesday, Moon is set to meet Kim in Pyongyang to push forward inter-Korean reconciliation and help get the U.S.-North Korea dialogue back on track. As part of his talks with Kim, Moon must insist on denuclearization in coordination with the United States, even at the risk of renewed inter-Korean tension. Moon's main task in Pyongyang will be to draw North Korea into cooperation with South Korea and the United States without succumbing to North Korean calls for unity against interference from "external forces." The United States has pressed, without success, for early, significant North Korean gestures as a way to ascertain North Korean seriousness of purpose regarding denuclearization. National Security Advisor John Bolton has referred to a North Korean denuclearization process that would take only one year, and Pompeo is reported to have requested that North Korea send at least 60 percent of its nuclear warheads and fissile material out of the country as evidence of commitment to denuclearization. North Korea called this approach "gangster-like" and appeared to reject the proposal in its entirety, following Pompeo's July 6-7 visit to Pyongyang. North Korea has emphasized the order of the items contained in the statement from the June Singapore summit between Kim and President Trump, insisting that the establishment of peace arrangements and a new U.S.-North Korea relationship must come before Pyongyang makes moves toward complete denuclearization. Pyongyang has appealed directly to Trump to fulfill his promises in Singapore and make an end-of-war declaration prior to taking steps on denuclearization. Following the Singapore summit, North Korea met its pledges on the POW/MIA issue by returning 55 caskets of remains to the United States for further identification, in addition to unilateral (and reversible) shuttering of some nuclear and missile testing facilities. But these steps have neither reduced the North Korean threat nor diminished U.S. skepticism about Kim's declared openness to eventual denuclearization. In this week's meeting with Kim, Moon will explore the possibility of linking an end-of-war declaration to a North Korean declaration of nuclear and missile facilities. But he will also face pressure from North Korea to move forward with inter-Korean cooperation, despite the ongoing impasse with the United States. Prior to the Moon-Kim summit in April in Panmunjom, Moon's administration acknowledged that a critical failure of past South Korean efforts to promote engagement with North Korea was that inter-Korean relations failed had to move in tandem with U.S.-North Korea relations to make real progress on peace and denuclearization. Moon cannot lean too far forward on inter-Korean reconciliation without repeating past mistakes and playing into Pyongyang's hands by weakening the U.S.-South Korea alliance. The Moon administration's eagerness to reopen economic exchange with North Korea risks opening a rift between Washington and Seoul. Moon envisions economic cooperation with Pyongyang as a solution to South Korean economic woes, even as the United States continues to emphasize sanctions enforcement as the primary lever by which to pressure North Korea into denuclearizing. So while Moon must bridge the U.S.-North Korea trust gap, he must also maintain U.S.-South Korea trust. The gap on sanctions has grown with revelations that South Korean companies violated U.N. sanctions by importing North Korean coal. The U.S. is suspicions that Moon's pledge to open a liaison office at Kaesong and rebuild railways in North Korea will blow a hole in the sanctions regime, leaving Kim with both economic benefits and a nuclear arsenal. Meanwhile, Chinese President Xi Jinping has reopened North Korea's economic lifeline and tilted from economic coercion to geostrategic partnership with Pyongyang. This came partly in response to anxiety that a combined inter-Korean and U.S.-North Korean rapprochement, symbolized by the Singapore summit, might come at China's disadvantage. Beijing's shift in focus from denuclearization to geopolitics and the emergence of a Sino-U.S. trade war have come at Seoul's expense, at a moment when U.S.-South Korea alliance coordination is crucial. It is reasonable for Moon to take on additional risk to avert the perceived dangers of the "fire and fury" from a U.S.-North Korean confrontation. But the success of his efforts will continue to depend on the ability of the United States and South Korea to coordinate effectively. If Moon sticks exclusively to the role of good cop toward North Korea, Trump will continue to be cast as the bad cop. A bit more "bad cop" from Moon might provide Trump with space to show flexibility with North Korea, while insisting on the bottom-line interest of both countries that Kim fulfill his pledge to work toward complete denuclearization.